Another state and federally subsidised middle mile project is spawning last mile service in northern California. Plumas-Sierra Telecommunications (PST), which is a subsidiary of the Plumas-Sierra Rural Electric Cooperative, provides Internet service to rural communities in Plumas, Sierra and Lassen counties. 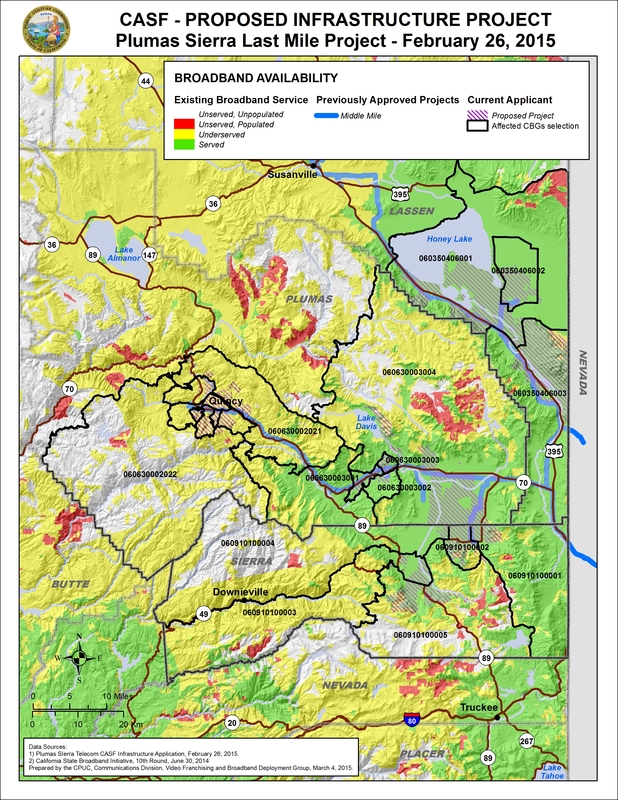 It recently filed an application for a $677,000 grant from the California Advanced Services Fund (CASF) to build out last mile service to 4,400 homes and businesses using middle mile fiber it built using money from the 2009 federal stimulus program and CASF. That fiber network now connects PST’s service area to long haul routes that go through Reno, Nevada. The publicly available summary that PST circulated doesn’t offer much detail about its last mile project proposal, except to say it “will use wired and wireless technology” and offer service starting at 10 Mbps down/5 Mbps up and topping out at 75/10. It’s likely, though, that most or all of the consumer-grade service it intends to provide will be delivered via fixed wireless systems: that’s what it told the California Public Utilities Commission when it got the middle mile grant in 2010, which is consistent with the low per-premise cost in the new proposal. PST applied for a subsidy of $154 per premise. Under CASF rules, they can ask for 60% to 70% of total construction costs, so the total per premise cost of the project is presumably somewhere between $220 and $257. That won’t buy much copper or fiber. The PST proposal goes into the hopper with ten other applications. Like the rest, it can be challenged by other service providers who meet the CPUC’s minimum service standard of 6 Mbps down/1.5 Mbps up, if there are any. Given the remote location and the fact that no one challenged them the last time, that seems unlikely.